To all those who are wondering what they can do to help in this time of sadness, confusion and great division in our national community – let your voice call for peace so that we can work together for a just solution. Please help me make this image go viral today! As I have watched the peaceful protests that began in Ferguson, spread to New York, and are now taking place across our country, I became acutely aware that there were no voices joined in song. We all know that music uplifts and heals the broken. It has the magic to bring people together in a common cause and it diffuses tensions−it is now scientifically proven that singing produces endorphins. Over the last few busy days, I had great intentions to secure an image I could use for a meme. I was also aware of the full moon rising today. When my photography friend posted this photo, I knew it was the one. It immediately made me feel peaceful. She graciously granted her permission for its use. In moon lore and legend, the Pink Moon rises in April when the pink moss is on the ground in northern hemisphere (wild pink phlox in forest regions). It signals a time of renewal and new beginnings. Could I have received any more perfect image than this? Here is my wish. 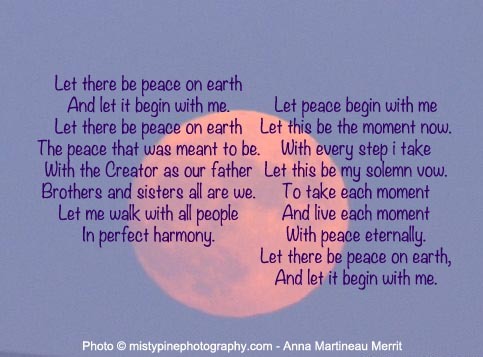 That somehow, today, with your help, this image will go viral and we will hear voices raising in harmony tonight, beneath the full moon and that peace will lift the hearts and spirits of everyone who hears the words, “Let there peace on earth and let it begin with me.” I hope too, that it will inspire all those who feel lost and hopeless, to lay down verbal arms and unite in a solution that serves peace and all life. I have changed a few words in the original lyrics to be more culturally inclusive and less denominational. Please help me to make this go viral.